At adajusa.it we offer you a wide selection of motopr protection switches designed specifically for the protection of electric motors. 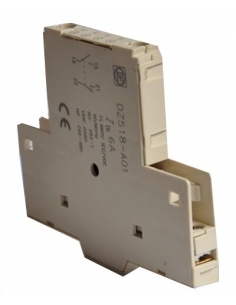 Here you will find switches with a regulation between 25Amp and 80Amp, type DZ518-ME (GV3). The use of circuit breakers helps to avoid and / or prevent breakdowns caused by overloads or faults in the circuit of electric motors, whether single-phase or three-phase. 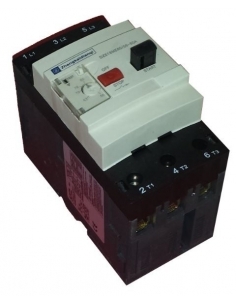 These switches can interrupt the activity of the circuits when the intensity of the current is excessive, thus protecting the installation. Do not hesitate and protect your electrical equipment or your installation with high quality circuit breakers at an exceptional price. Cámara para disyuntor de 2 contactos: abierto y cerrado (NO+NC), con montaje lateral sobre el lado derecho. Para disyuntores de M40 a M80. Cámara para disyuntores de 2 contactos laterales abiertos (NO).Montaje lateral sobre el lado derecho. Para disyuntores de M40 a M80.